One of the nice gifts awaiting me in my mail when we returned from Florida was my copy of Lee Hopkins latest anthology, LULLABY & KISSES AND SWEET. It’s a board book for wee ones published by Abrams Appleseed and features poems by many names you’ll know plus a few you’ll want to know. I’m very happy to be among the contributors to Lee’s collection. It’s a handsome book that’s sure to make its way into many homes here and abroad. I’ll finish packing in a few minutes and be off to the Children’s Literature Festival in Warrensburg. But first I have to unpack my bags from Florida to make room for clean underwear and such. As my summer series of return Featured Guests rolls on, today it is my privilege to bring back Lee Bennett Hopkins. Yesterday you met Lee by way of a bio. Today you meet the man and his philosophy. I hope you’ll feel free to comment and pose questions. Now, here’s Lee, who has added notes about his upcoming book. FULL MOON AND STAR is a picture book about two young children, Kyle and Katie, who write plays for one another about the universe. I am so pleased to have Marcellus Hall on board as artist since we did CITY I LOVE together. I haven’t done a picture book in eons so this is a very special book to me. FULL MOON… brings together my love of theatre, playwriting, and a unique friendship between two children. I even had great fun with the dedication which reads: To my sister, Donna Lea Venturi, my favorite leading lady. And she is! A paperback edition will be exclusively distributed in the British Isles. Here is Lee’s original Featured Guest spot. Having used poetry as an elementary school teacher for many years and seeing what it can do to enhance the lives of all children, everywhere,the genre became a favorite of mine. I suppose I started by accident. The first poem I penned, “Hydrants” written in the late l960’s was a result of my city-living. The first person who heard it was May Swenson, the great American Poet, who further encouraged me. At her home in Long Island I read it to her (cautiously) before dinner. After dinner she asked me if I would read it again! After her comments all I did was want to write. The more I read the more I wanted to write. I absorbed the best at the time: David McCord, Myra Cohn Livingston, Lilian Moore, Eve Merriam, Karla Kuskin, Aileen Fisher etc., all of whom later became personal friends of mine. who had asked me a long time prior to speak at a dinner meeting in South Carolina! As I was eating spaghetti all I could think of was Mr. Jones. My agent, the great-late Marilyn E. Marlow accepted the award for me…and never let me forget the moment! …YESTERDAYS continues to be read and read and used in all kinds of programs from youth groups to Al-Anon groups. The small book has touched so many; I never knew the power of the words could have gone on so long. And of course, my latest, CITY I LOVE (Abrams), starred in SCHOOL LIBRARY JOURNAL and PUBLISHERS WEEKLY, compiles many poems I wrote about city life and living. To capture sights and sounds of urban life and put them into poems was a great challenge. Ah: “In the city/I live in–/city I love—“: Ironically I now live in a suburb of Florida but often yearn for my city digs. Come Spring, 2010, I have two collections that will appear. One is SHARING THE SEASONS (McElderry Books) illustrated by David Diaz. David and I wanted to work together even before he won the Caldecott Medal for SMOKY NIGHT, by Eve Bunting (Harcourt). His work on SHARING THE SEASONS is truly spectacular. And each poem resonates with new looks at each season of the year…many written exclusively for this collection by some of our top children’s poets – Rebecca Kai Dotlich, Joan Bransfield Graham, Marilyn Singer. Poetry should be used every day throughout the curriculum for nothing – no thing – can ring and rage through hearts and minds as does this genre of literature. I’ve written it, I’ve shouted it, I’ve said it, I’ll say it over and over and over again – PASS THE POETRY, PLEASE! Thanks to Lee for sharing his passion about poetry and its place in our lives no matter what our age. Comments? ANNOUNCEMENT: While looking for one thing, I just found another; actually, two other things: my first and second publications. You’re going to love the titles. Number one: THE GROWTH OF THE RAT TAPEWORM, HYMENOLEPIS DIMINUTA, DURING THE FIRST FIVE DAYS IN THE FINAL HOST, published in The Journal of Parasitology. Number two: A STATISTICAL ANALYSIS OF MOUSE MOTOR ACTIVITY DATA AS RECORDED WITH THE NUTATING ANNULAR ACTIVITY CAGE, published in The Pharmacologist. Ah, those were the days! Tomorrow it will be my pleasure to reintroduce Lee Bennett Hopkins to you. Today I’m reposting the bio he sent for his original Featured Guest spot. Knowing Lee, this is undoubtedly out of date already, but it will give you some idea of his activities, interests, and accomplishments. 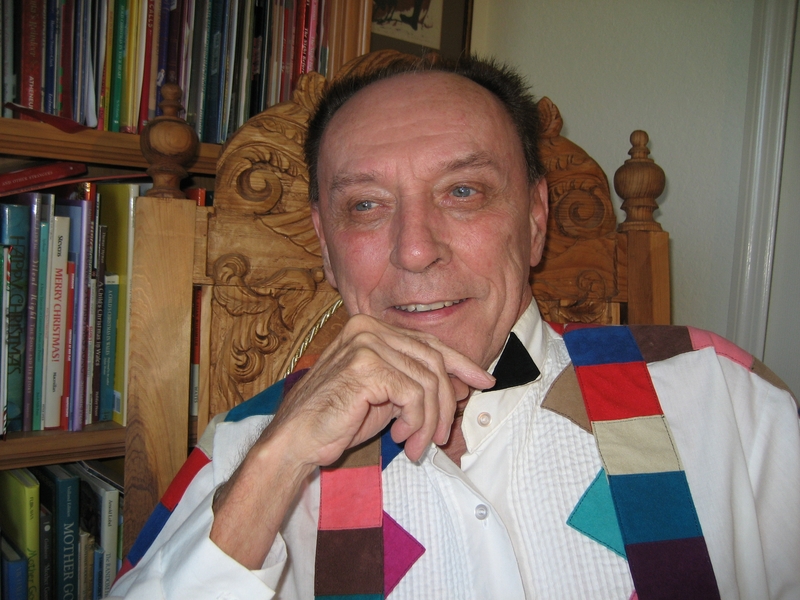 Lee Bennett Hopkins has written and edited numerous award-winning books for children and young adults, as well as professional texts and curriculum materials. He has taught elementary school and served as a consultant to school systems throughout the country. Born in Scranton, Pennsylvania, Hopkins graduated Kean University, Bank Street College of Education, and holds a Professional Diploma in Educational Supervision and Administration from Hunter College. In 1980 he was awarded an honorary Doctor of Laws degree from Kean University. in 1989 he received the University of Southern Mississippi Medallion for “outstanding contributions to the field of children’s literature” in recognition of his work; 2009 brought him the National Council of Teachers of English (NCTE) Excellence in Poetry for Children recognizing his aggregate body of work. Among his original collections are Been to Yesterdays: Poems of a Life (Boyds Mills Press) an autobiographical book of poetry that received the prestigious Christopher Medal and a Society of Children’s Book Writers and Illustrators (SCBWI) Golden Kite Honor Award, Alphathoughts: Alphabet Poems, and City I Love (Abrams, 2009), illustrated by jazz musician, Marcellus Hall, starred in both PW and SLJ. His award winning series of American History through poetry for children and young adults include Hand in Hand: An American History Through Poetry, illustrated by Peter Fiore, My America: A Poetry Atlas of the United States, and America At War, both illustrated by Stephen Alcorn (all Simon & Schuster/McElderry Books). To encourage the recognition of poetry, he has established two major awards: the Lee Bennett Hopkins Poetry Award, presented annually by Penn State University for a single volume of poetry, and the Lee Bennett Hopkins/International Reading Association Promising Poet Award, presented every three years by IRA. My thanks once again to Charles Ghigna for being my guest yesterday. If you haven’t had time yet to read the interview, I hope you will mark it to read later. I told you that I’ll present in November in Orlando at National Council of Teachers of English (NCTE) about our Word of the Month Poetry Challenge. I hope to see some of you there and I encourage you to tell teachers you know to come to my session from 8:00 – 9:15 on Saturday morning, November 20. There will be a fascinating panel on Friday morning that I recommend and will attend if my flight schedule permits. It’s called Poets and Bloggers Unite: Using Technology to Connect Kids, Teachers, and Poetry. Doesn’t that sound interesting? Our friend Sylvia Vardell, http://www.blogger.com/profile/00570078181499700656) put the panel togetherand it includes Lee Bennet Hopkins, http://www.answers.com/topic/lee-bennett-hopkins ; Marilyn Singer, http://www.marilynsinger.net ; Pat Mora, http://www.patmora.com/ ; Jame Richards, http://www.jamerichards.com/ ; Tricia Stohr-Hunt, http://missrumphiuseffect.blogspot.com/ ; and Elaine Magliaro, http://www.blogger.com/profile/09829330276633865868 .You will recognize Sylvia, Lee, Marilyn, and Tricia who have all appeared as guests and/or contributors on my blog. Here’s a glimpse into what Sylvia and the panel intend to discuss: We’ll consider how poets, teachers, and kids can use technology to connect through poetry. Together, we’ll use the interactive medium of the do-it-yourself blog to think deeply and broadly about how virtual learning environments and authentic literacy experiences can inspire and empower students and teachers, connecting with the wider, “real world” community in purposeful ways. What kinds of poetry and strategies engage students to wonder and explore, ask big questions, make discoveries and connections, and learn about themselves and others? Thanks to the remarkable influece of today’s technology, a panel of dynamic people like these come together to consider how to harness the power of technology to bring poetry into the lives of young readers. I hope some of you will have a chance to attend this session, which takes place on Friday from 9:30-10:45. If you have thoughts or comments on this subject, please let us know. Thanks!